At Sponaugle Wellness Institute, we specialize in treating brain disorders including Brain Trauma, commonly called TBI or Traumatic Brain Injury. Many of our brain injury patients have been professional athletes whose brain “took a beating” in their careers; Wrestlers, NFL players, Hockey players and even nationally ranked martial arts professionals. Before Dr. Sponaugle treated Mr Kosar’s traumatic brain injury, he suffered with daily headaches, ringing in the ears, short term memory loss, difficulty with speech and insomnia. 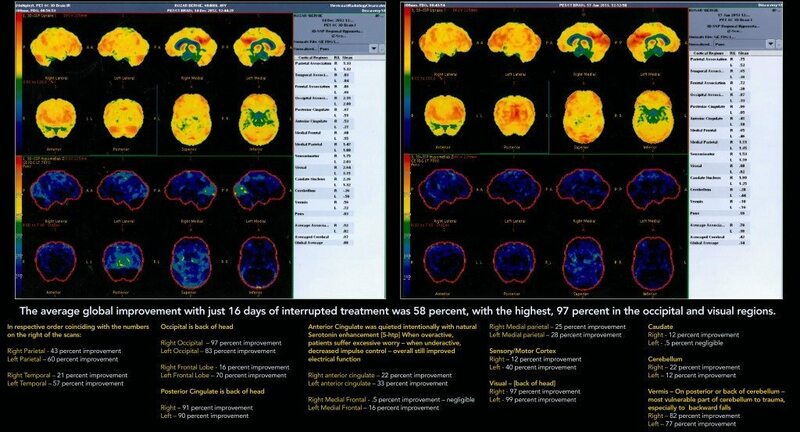 Comparison of Kosar’s PET scans, before and after brain trauma treatment at Sponaugle Wellness Institute, demonstrates dramatic improvement of global brain function with the most improvement, 97 percent*, in those brain regions that suffered the most injury. The PET scan computer provides a mathematical calculation of brain activity. This allows for objective validation of improvement in brain function. Dr. Sponaugle’s brain trauma treatment produced 97 percent improvement in the back of Bernie’s brain and 67 percent on the left side of his brain*. 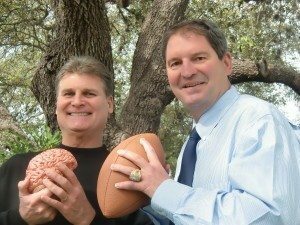 Dr. Sponaugle’s clinical research on brain trauma has proven that quarterbacks sustain more brain trauma to the posterior brain regions in the back of their head. When sacked by larger linemen and linebackers, they tend to fall backwards “slamming” the back of their head on the hard turf. This correlates with Bernie’s pre-treatment PET scan which demonstrates that he suffered the most brain trauma in the back of his head, the occipital, visual and vermis brain regions. As well, right-handed quarterbacks like Bernie typically sustain more “helmet to helmet” hits on their blind side, their left side. Indeed, Bernie sustained more brain trauma on the left side of his brain as seen on his initial PET scan. Note the most improvement derived from Dr. Sponaugle’s brain trauma treatment was on the left side of Bernie’s brain*, the side that sustained the more injury. Bernie Kosar was notorious for throwing long “Hail Mary” passes which gave defensive linemen and linebackers more time to breach his offensive line, Bernie’s longest pass during an NFL game was 96 yards. Numerous pictures taken when Bernie played for the Cleveland Browns depict “larger than life” defensive tackles broaching Bernie’s left side while his right arm is still releasing the football. On a micro level, the “bruised” brain region develops significant inflammation which subsequently produces Alzheimer’s like TAU bodies and abnormal plaque development. Trauma induced inflammation causes excessive activation of the blood clotting cascade which causes further reduction in blood flow by narrowing the “pipes” of the brain’s microcirculation. The injured brain region then receives less vital nutrients needed for repair of damaged brain tissue and less oxygen delivery to the injured brain cells that need it most. With less blood flow going to the traumatized brain region, there is, again, less delivery of excitatory or electrifying brain chemicals that are needed to “turn on” the lights, if you will. With reduced electrical current running through the injured brain region, brain function in that region essentially “shuts down.” To make matters worse, brain blood flow follows electrical current, thus a self perpetuating downward spiral. However, using the Sponaugle brain trauma treatment protocol for brain healing, the brain trauma process, mechanism by mechanism, can be reversed with resultant healing of the injured brain region. With the Sponaugle Brain Wellness program, including our proprietary intravenous therapy, we can reverse the TBI changes on brain scan and rid patients of traumatic brain injury symptoms in a few weeks*. We have been very successful in reversing their TBI symptoms of: Dementia, Depression, Brain Fog, Memory Loss, Moodiness, Irritability, Anxiety, Insomnia, Panic, Rage, Head Aches, Tinnitus [Ringing in the Ears] and feelings of disassociation, feeling like you are disconnected from your loved ones, watching the world go by, but you are not in it*. These are common symptoms experienced by brain injury patients, symptoms that America’s neurologists mistakenly believe are irreversible because they refuse to learn the biochemical and physiological reactions, that on a microcellular level, control the electrical activity of our brain, our brain function. To restore normal brain function in TBI patients, we must use biochemistry to heal the brain on a microcellular level, from the inside out! Brain function and mental performance depend on adequate delivery of brain chemicals to each individual brain cell. The brain is an electrical organ, but, the brain‘s electrical current is controlled by chemical messengers called neurotransmitters. They constantly move from brain cell to brain cell activating electrical energy. Here in lies the problem with brain injury. With today’s high tech Brain scans, we have learned that the small blood vessels on the brain’s surface suffer bruising as they “slam against the skull” during an event with enough G-Force. Approximately seven weeks after the head trauma, the bruised blood vessels “scar down” delivering less oxygen, glucose and brain chemicals to the brain cells in the traumatized brain region. Before the advent of brain scans that measure blood flow and the brain’s metabolism of sugar, both of which correlate with electrical activity in the brain, we didn’t know that patients could sustain serious brain trauma without losing consciousness. We were clueless that the brain moved around inside of the skull and, that with enough impact and G-Force, the soft brain would slam up against the hard skull, causing Brain Damage.